My very creative and talented friend Christina causally mentioned an event happening in the high desert about some place out in the middle of nowhere literally—where we can eat ramen noodles under the full moon. It gets better. You head out into the middle of the desert and try to find a very tiny restaurant bunker (GPS coordinates provided) and eat good food–unless they run out. Full moon? Desert wilderness? Hunting for carbs? That’s all I needed to hear, and I knew my mom would be up for the adventure too, so a couple of hours later, the three of us drove 2 ½ hours straight into the wild desert yonder for a moonlit adventure—not knowing exactly what was ahead for us. 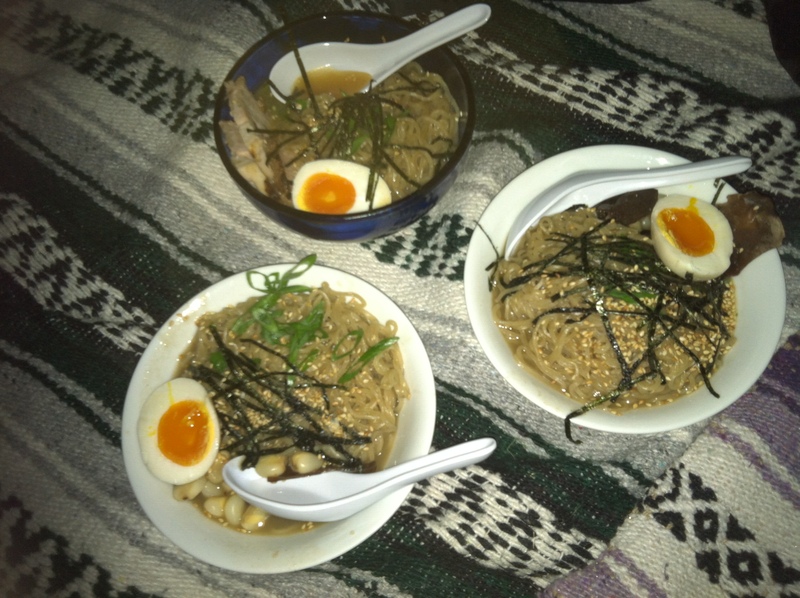 According to the website, the partially subterranean Secret Restaurant was hosting a “Full Moon Ramen” for those willing to make the drive, go walking in the desert by the light of the moon, and chow down on some good food under the stars. The site is nearly impossible to find…unless the Secret Restaurant is open. As we reached the turnoff from the main road, the moon was already rising in the east, while the sun was setting in the west. We continued to drive down a dirt road for about a mile until we came upon more than 20 parked cars along one side of the road. Figuring we were at the right spot, we parked and found a great sculpture of a bowl of ramen marking the beginning of a .3 mile trail to our destination. When the restaurant is open (a couple of days a year), you need only to follow the luminarias into the desert leading you to a tiny, 16 sq. foot kitchen. The “kitchen” space can only accommodate two cooks (barely), and is said to be designed to be unnoticed in satellite images. Diners are left outside to choose a patch of desert where any spot is a good spot to enjoy the muted sites, sounds, and cooking smells. After about a 15 minute walk alternating between sandy washes and the repeating networks of animal burrows we referred to as “ankle breakers,” I looked up to see a line of people materialize out of the sunset-washed desert. About 70 diners were already lined up, chatting, laughing and waiting for their turn at the kitchen to watch their meal be prepared. By this time it was on the darker side of dusk and the desert was drawing in its last breath of an orangey-glow from the hidden sun. The soft pink and purple evening sky was transitioning into a night-blue sky, bright with moonlight. We were guided to the stash of ceramic bowls (blue for meat option, white for veggie option), and ceramic soup spoons and chopsticks for utensils. We got in line and eagerly waited for our turn, munching on some delicious cucumbers marinated or tossed in what we think was a sesame-ginger dressing. Mmmmm. I could’ve eaten those all night. Really. The aroma of cooking noodles and broth would waft down the line from time to time. Two and a half hours later, we found ourselves at the front of the line. Honestly, the wait wasn’t a big deal as we got to know people in line and learned our fellow diners came from all over southern California including Los Angeles, Orange County, and desert locals “far and wide.” The crowd (I estimate about 130(?) while we were there) was laid back, just enjoying this unique night so graciously and generously provided. 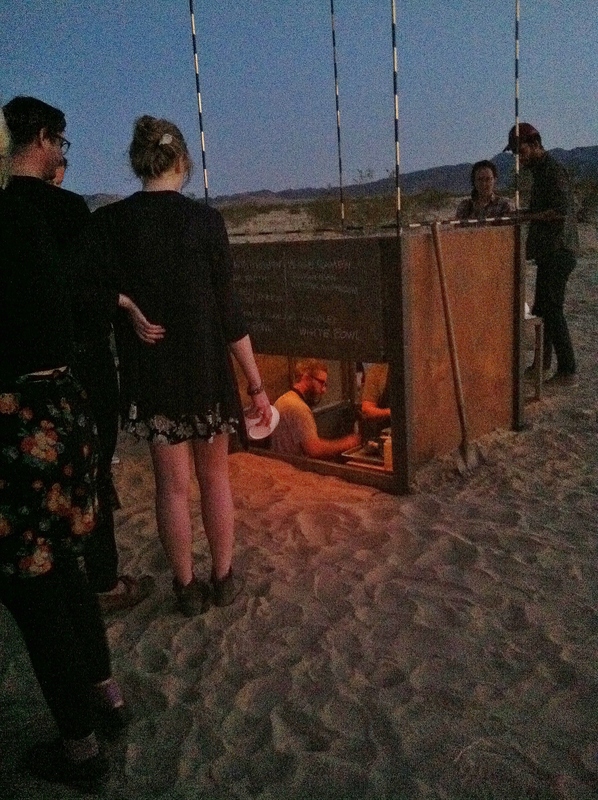 High Desert Test Sites welcomes back SECRET RESTAURANT’s for another course, Full Moon Ramen, an art project by Bob Dornberger and Jim Piatt, a 16 sq. ft. partially subterranean restaurant open only a few days per year. For me, it was a night I will never forget in a setting I am happiest. I am thankful to the inspired and talented people behind this project. Not to mention the logistics, time, costs and sheer people power this must have taken to accomplish. The three of us stretched out on our blankets to stargaze with full bellies. 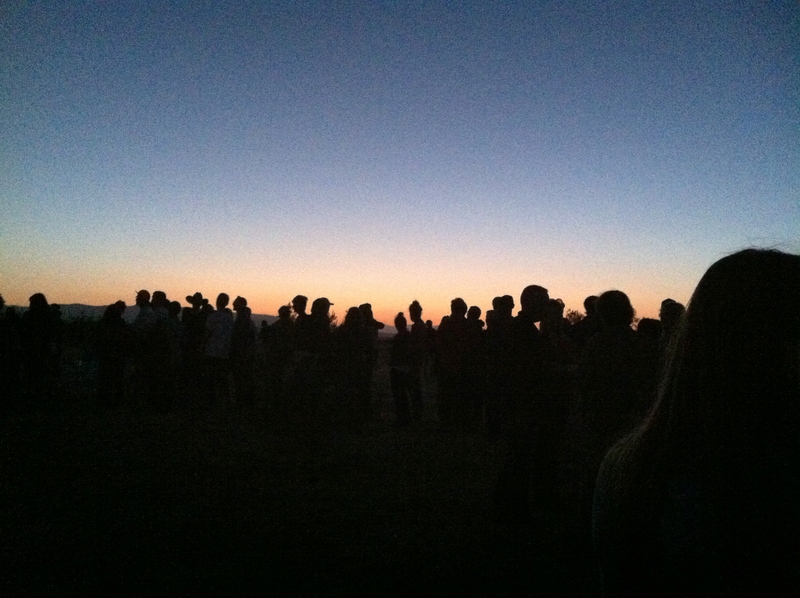 I couldn’t think of a more fantastical way to provide a unique experience in our beautiful desert environment: bringing people together through food in a sensory-filled night of sight, smell, hearing, touch and taste in the vast expanse of the desert, under the happy glow of the full moon and smiling faces. I feel lucky to be in that moment and grateful for this one-of-a-kind experience. Thank you High Desert Test Sites, Bob Dornberger and Jim Piatt and all involved for bringing this idea to life for another course. Cheers! 16 Mar	This entry was published on March 16, 2014 at 10:30 PM. 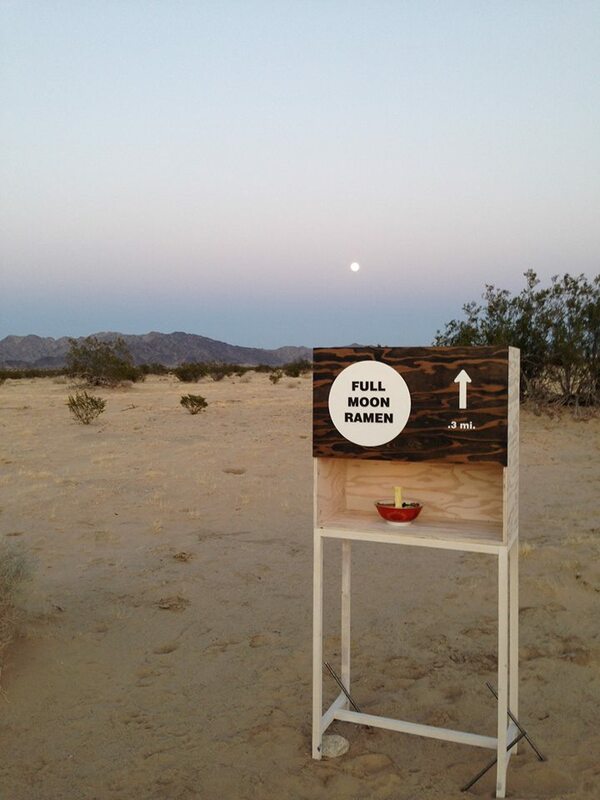 It’s filed under Other and tagged Full Moon Ramen, High Desert Test SItes, Secret Restaurant. Bookmark the permalink. Follow any comments here with the RSS feed for this post. Older: What Is “Blessing the Image” In SoulCollage®?